Benjamin Graham Enterprising Investor is a deep value investing strategy based on rules suggested by legendary investor, Benjamin Graham, who wrote The Intelligent Investor. The strategy focuses on value stocks and the ability to buy them with a significant margin of safety. It uses valuation ratios including price-to-earnings and price-to-book but also looks for a history of earnings growth and dividend payouts. Ben Graham once said: "The determining trait of the enterprising investor is his willingness to devote time and care to the selection of securities that are both sound and more attractive than the average." 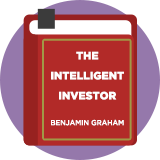 Enterprising Investor is a less strict approach than Ben Graham's defensive strategies, which often focus on large, well financed and profitable companies. Instead, it looks for unpopular companies, special situations and 'bargain' issues. Presents the philosophy of 'value investing', which helps protect investors against the areas of possible substantial error and teaches them to develop long-term strategies with which they will be comfortable down the road. This book enables you to make the right decisions to protect your investments and make them a success.